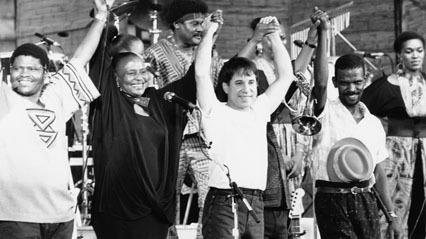 The Documentary Premieres section hosts Sundance alumnus Joe Berlinger: UNDER AFRICAN SKIES revisits Paul Simon’s legendary South African album and the controversy that surrounded it. Paul Simon’s historic Graceland album sold millions of copies and united cultures, yet divided world opinion on the boundaries of art, politics, and commerce. On the occasion of the twenty-fifth anniversary of Graceland’s release, Simon returns to South Africa for a reunion concert that unearths the turbulent birth of the album. Despite its huge success as a popular fusion of American and African musical styles, Graceland spawned intense political crossfire. Simon was accused of breaking the United Nations’ cultural boycott of South Africa, which was designed to end apartheid. The prolific Berlinger brings his fifth film to Park City, after Audience Award winner BROTHER’S KEEPER (1992), PARADISE LOST: THE CHILD MURDERS AT ROBIN HOOD HILLS (1996), METALLICA: SOME KIND OF MONSTER (2004), and CRUDE (2009). Famously, PARADISE LOST spawned two sequels, and the media attention the first two films brought to the case of the West Memphis Three mobilized a grassroots effort to help secure their recent release. CRUDE was the subject of a contentious First Amendment battle with the doc’s antagonist, Chevron – echoes of the David vs Goliath struggle of fellow 2012 Sundance film BIG BOYS GONE BANANAS!*. Joining Berlinger as producers on his latest film are @radical.media’s Jon Kamen (executive producer of the Oscar winning THE FOG OF WAR, METALLICA, and CRUDE) and Justin Wilkes (executive producer of CRUDE, PARADISE LOST 3), and A&E IndieFilms’ Molly Thompson (executive producer of Sundance alums AMERICAN TEEN, THE SEPTEMBER ISSUE, THE TILLMAN STORY, and CORMAN’S WORLD). While fans of Paul Simon and his Graceland album will especially enjoy the reunion that takes place, even those viewers unfamiliar with the music should respond to the larger issues around the album, the cultural boycott, and its place in South Africa’s history. Like fellow 2012 Sundance doc, SEARCHING FOR SUGAR MAN, which also has a significant South African connection, Berlinger’s film demonstrates the power of music to transcend borders and influence political transformation. The film’s Facebook page may be found here. For screening dates and times at Sundance, click the link in the first paragraph.